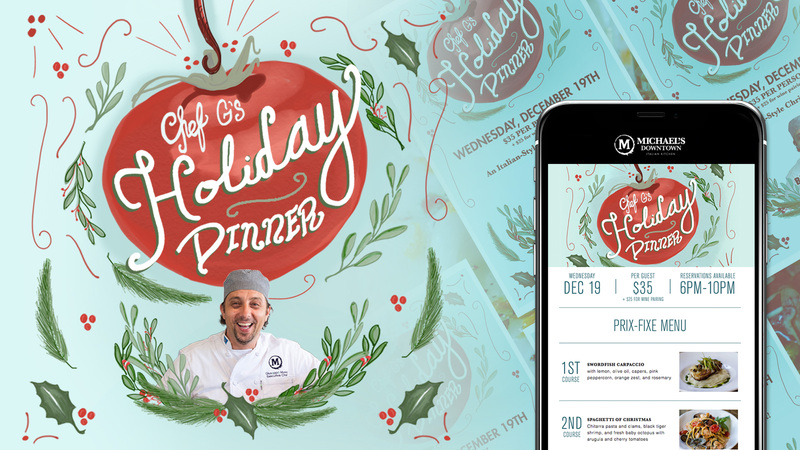 Special event promotions are one of our specialties, and promoting a festive and delicious event like Chef G’s Holiday Dinner party made our job that much more enjoyable. Practically anyone can throw some free graphics and stock photography on promotional material for a special event, but that’s not how you get your work to stand out from the rest. Our creative team came up with a holiday-meets-dining theme that kept the fun and festive vibe of the event and hand-illustrated the artwork for an extra-customized look and feel. This kind of attention to detail can easily get looked over but can go a long way when it’s done correctly. The whole point of this event is to get people to come in for a unique dining experience, and the food is definitely the star. 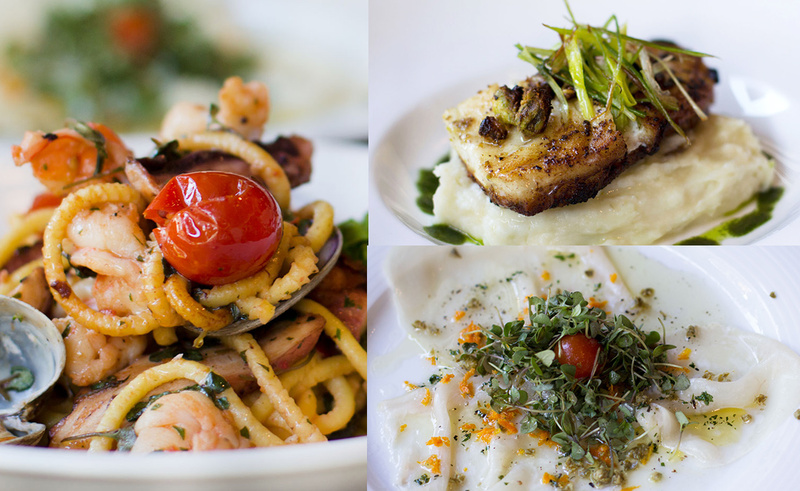 Michael’s Downtown, located on the Promenade in Long Beach, CA, is famous for using the freshest, locally sourced ingredients, to make Chef G’s modern Italian dishes really shine. There was no way we could use stock photography for this—it would be blasphemy. Instead, we sent our in-house photographer to the restaurant to take mouth-watering shots of the food so that people get a true and authentic picture of what they can expect during the holiday pasta tasting. Showing off delicious food is the best way to get people excited about attending an event! We utilized our designs and photography in a variety of different ways, including in-store promotions. Table tents were created so that anyone who dines at the restaurant could read about the event while they are enjoying their meal, and check presenters were put into all of the bill folders as another check-point for guests to feel invited back for the special holiday pasta tasting. Both of these pieces of collateral are also a great way to remind servers to mention the event to their guests, talk about how delicious the food is going to be, and encourage them to make reservations before they leave. A series of two emails were sent to our Michael’s Downtown email list. Subject lines and the days and times that they were sent out were all strategically chosen based on data from previous email campaigns sent to this particular audience. The branding remained consistent between all print and digital materials, and the call to action in the emails sent readers either to a landing page to learn more or directly to make their reservation. This is a nice way to approach marketing emails, because it gives people options and time to think about if they want to take action (like book a reservation) or think about it. Also, by the time they receive the second email, we have nurtured them enough to book. Landing pages are a great place to send online traffic for a very specific purpose, which is why we like using them for restaurant event promotions. They are only one page, so no one can get distracted by clicking around too much. They are branded just like the rest of the event materials and have very clear messaging. We want people to land on the page and know exactly what we are hoping they do there. We created events, ads, videos, and organic posts for both Facebook and Instagram for this campaign. Social media is a really fun element to add to a special event promotional campaign, because it gives you the opportunity to communicate directly with your audience. If anyone had a question, we were able to answer it within a few hours, typically. Social media is also the perfect place to post more of the amazing food photography that we had taken of all of the courses of this amazing menu, which we took full advantage of. Any time you can use the hashtag #foodie, you are going to find success on social media to promote your event.